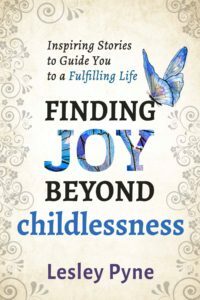 I've listed below a range of books about childlessness and moving on that I've found helpful. The two books I recommend most often to clients (and wish I'd written myself 🙂 ) are Lisa's book 'Life Without baby: Surviving and Thriving When Motherhood Doesn't Happen, and Tracey's 'The Next Happy: Let Go of the Life You Planned and Find a New Way Forward. You can read more about them and others below. 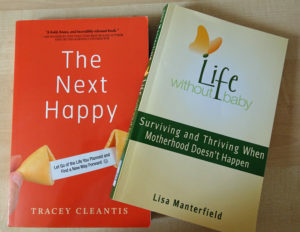 Lisa Manterfield has collated her her vast experience of running workshops and writing ebooks into Life Without Baby: Surviving and Thriving When Motherhood Doesn't Happen (Amazon US Link) On the back it says that it 'offers a combination of hard-won lessons, gentle queries, and real world suggestions.' I agree completely that Lisa is a 'comforting and supportive companion who will guide you gently down your own path to making peace with being childfree-not-by-choice and thriving in a new happily ever after. Here's my Amazon review. [dropshadowbox align="none" effect="lifted-both" width="700px" height="" background_color="#ffffff" border_width="1" border_color="#dddddd" ]As soon as I started reading 'surviving & thriving... ' I felt that Lisa was right there with me, leading me gently by the hand and giving me permission to feel anything. She acknowledges how messy it will be, gives practical ways to get through, and lots of assurance that it will get better. The book takes readers from 'How to Let Go of the Dream of Motherhood' through to 'Thriving in a New Happily Ever After' via the twists and turns of grief and 'Dealing with Day- to-Day Challenges'. It includes some helpful 'Dear Diary' exercises and techniques and Lisa uses her own honest story as an example of what she did and didn't do. In addition to how to help yourself, there are other practical sections such as how to deal with your parents, how the man in your life will grieve differently and dealing with other people's children. For me, the grief section is particularly helpful; it's the first time I've seen childless grief described in such an empathic and compassionate way. [dropshadowbox align="none" effect="lifted-both" width="700px" height="" background_color="#ffffff" border_width="1" border_color="#dddddd" ]Sometimes when you read a book it grabs you by the throat and says 'this is important,' well The Next Happy did this to me. It's a handbook and a guidebook for deciding when to stop pursuing a dream and it includes some great tools and techniques to help readers work through their loss and find their next happy. I've been in Tracey's shoes and I wish that this book had been available when I was trying to come to terms with my own childlessness as it would have helped me enormously. I interviewed Tracey about the book and you can watch us here. Pamela has also written Finally Heard: A Silent Sorority Finds it’s Voice and you can read more and listen to my interview with Pamela here. Lisa Manterfield's book I'm taking my eggs and going home:How One Woman Dared to Say No to Motherhood is described as 'In this gritty, award-winning memoir, Manterfield traces her spiraling route from rational 21st century woman to desperate mama-wannabe. She examines the siren song of motherhood, the insidious lure of the fertility industry, and the repercussions of being childless in a mom-centric society. But this isn’t just another infertility story with another miracle baby ending, nor is it a sad introspective of a childless woman; this is a story about love, desire, and choices—and ultimately about hope. It is the story of a woman who escapes her addiction, not with a baby, but with her sanity, her marriage, and her sense-of-self intact. You can find it HERE. The intro for Jessica Hepburn's book The Pursuit of Motherhood' says... 'If you’ve ever felt a crumpling in your chest when another friend tells you they’re pregnant… If you’ve ever wondered why everyone else seems to find it so easy…If you’ve ever experienced the pursuit of motherhood...This book is for you'. You can read about the book HERE. [dropshadowbox align="none" effect="lifted-both" width="700px" height="" background_color="#ffffff" border_width="1" border_color="#dddddd" ]This is different from any other infertility book because, from an early age Justine knew that she could never get pregnant. It chronicles her heartbreak and her struggles to really own her story. Her words will resonate with all of us who have been through infertility and what really stood out for me was how she realised that the choice was hers, and that choosing to own her story would give her the power to be happy. She particularly talks about owning the decision not to adopt and the techniques she uses are something we can all learn from. Saying that all her relationships have changed will resonate deeply with her readers and I particularly found her friendship categories helpful, how it can be surprising who will be in each category and that sometimes it is best for us if we let people go. Jody Day's book 'Living the Life Unexpected: 12 Weeks to Your Plan B for a Meaningful and Fulfilling Future Without Children' gives you a 12 week programme to create a meaningful life. You can read more about it and the reviews here. You can read about other books that have helped me here. This page is a work in progress, I'll be adding more and please contact me if there are any books you would like to see on this page.